We decide the priority of our development through the number of each page visitors. Please come to check the update often. Also, please introduce it to more number of people. The more people visit the page, the quicker we will develop the program! 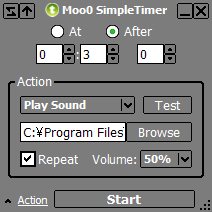 Moo0 Simple Timer is a simple and easy timer tool. Don't you sometimes want to be reminded of some specific time/after-duration? but don't want to use complicated programs? This may be the tool you've been looking for. This tool currently supports 4 timer actions which are Play Sound, Open File, Open Webpage and Shutdown System. Wondering about the Skins? - You can check them out here. Chinese (Simplified) support was made possible by Zhang Zhe. Thanks really a lot!! Hungarian support was made possible by lostprophet at Lostprophet Magyarítások. Thanks really a lot!! Greek support was made possible by geogeo.gr at geogeo.gr. Thanks really a lot!! Romanian support was made possible by Jaff (Oprea Nicolae) at MIDI MANiACS. Thanks really a lot!! Arabic support was made possible by Majed Alotaibi. Thanks really a lot!! Using at Workplace / Internet Cafe? Please support us via donation. Please tell us anything to improve this program! It might be better if...I wonder how to...Is this a bug?Thank you!anything!